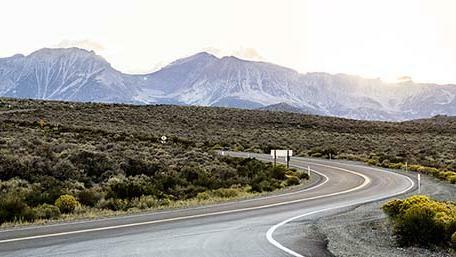 For the next seven days, we're taking you on a fall road trip through the Eastern Sierra of California and Nevada. For the next seven days, we’re taking you on a fall road trip through the Eastern Sierra of California and Nevada. We’ll go behind the scenes of our September issue’s cover story, “The Road to Gold,” with bonus photographs and videos. Follow along and use our daily itinerary to plan your own trip up quiet, gorgeous U.S. Highway 395. See days 2, 3, 4, 5, 6, and 7. 9:30 a.m.Eastern Sierra Nevada InterAgency Visitor Center Prepare for the road trip with maps and brochures. 640 S. Main St., Lone Pine; (760) 876-6222. 10 a.m.Museum of Western Film History Pick up the Movie Road Self-Guided Tour booklet ($2 suggested donation) and marvel at movie artifacts. $5; 701 S. Main St.
11 a.m.Alabama Hills A whimsical maze of rounded boulders, golden-hued arches, and badland gullies, the Alabama Hills have been the ideal backdrop for dozens of westerns. Take a walk on the Arch Loop Trail to snap photos of 14,505-foot Mt. Whitney, highest peak in the contiguous United States, framed within the twisted span of Mobius Arch. 12 p.m.Whitney Portal Road & Store Instead of hiking Mt. Whitney, drive the view-filled Whitney Portal Road. Then stop at the Whitney Portal Store for mountainous pancakes or burgers. $; 238 S. Main St.
12:30 p.m. Manzanar The sprawling desert site was the first of 10 camps used by the U.S. military to confine Japanese Americans and their families during World War II. The visitor center has 8,000 square feet given over to exhibits and offers an outstanding 22-minute film called Remembering Manzanar. West side of U.S. 395, 9 miles north of Lone Pine. 2 p.m.Mount Whitney Fish Hatchery The Mt. Whitney Fish Hatchery looks like a Tudor-style wine country estate, but for nearly a century it served as a trout-raising factory. Today its vine-covered granite walls house a wildlife interpretive center. Spread a picnic on the shady lawn or feed the mammoth trout in the pond. West of U.S. 395, 2 miles north of Independence. 3 p.m.Eastern California Museum See a collection of Eastern Sierra treasures: human dentures made from coyote teeth, an Ice Age mammoth femur, and jelly bean-size gnatcatcher eggs. 155 N. Grant St.
4 p.m. Copper Top BBQ Order tri-tip, pulled pork, ribs, or chicken at the window, then stake your claim on a picnic bench and admire the turrets and towers of the Palisades. $$; 310 N. Main St.
5 p.m. Ancient Bristlecone Pine Forest Forty-century-old Great Basin bristlecone pines dot the lofty reaches of the White-Inyo Mountains. The drive to the bristlecone forest is slow going, with a 6,000-foot ascent from Big Pine and no gas stations or convenience stores along the route. At the Schulman Grove area, walk among the ancients on the 1-mile Discovery Trail or the 4.3-mile Methusaleh Trail. $3/adult or $6/vehicle; East of U.S. 395 on Main St.
Sleep: Best Western Plus Frontier Motel Head down to this motel back in Lone Pine, where the rooms are named after western stars such as Barbara Stanwyck, and the sweeping views encompass the Sierra and Alabama Hills. 1008 S Main St.; From $115.